I have extremely fond memories of my father taking me to the Cleveland Airshow. It’s what set the stage for my desires to go into the military and hence, my graduation from the U.S. Merchant Marine Academy, Kings Point. 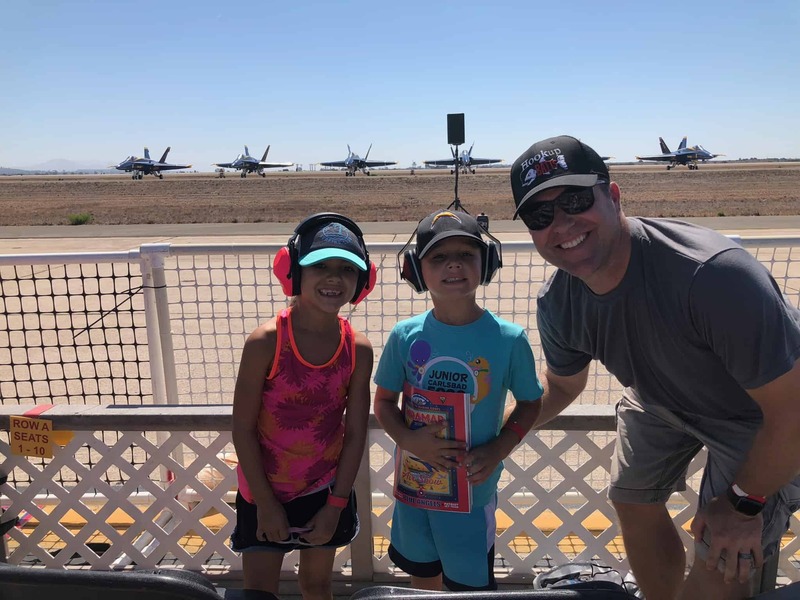 Fast forward a few decades and I’m finding myself equally as excited to bring my kids to the San Diego Miramar airshow. And it was awesome to see our military in action, and witness the power and massiveness of our jets, equipment and forces. We had front row seats, along the fence right on the tarmac in front of the Blue Angels as they were parked all day until they took off for the day’s finale. On Sunday, we went to see them again but not from the airshow. Our neighborhood backs up to the Miramar flight path so there are miles of unpopulated land. A quick little hike out of the back of our neighborhood gave us 360deg views. While it’s not as up close and personal, it was still a great viewing spot. I know the kids will cherish these memories the same as I do with my dad.